I missed yesterday's Flower Friday challenge - I don't think a tree counts - so I've made up for it today with this flowering cactus. Mum bought it for me last weekend as a gift for having her to stay for a week - though a warm, clean house when I got in from a long day at work was thanks enough! 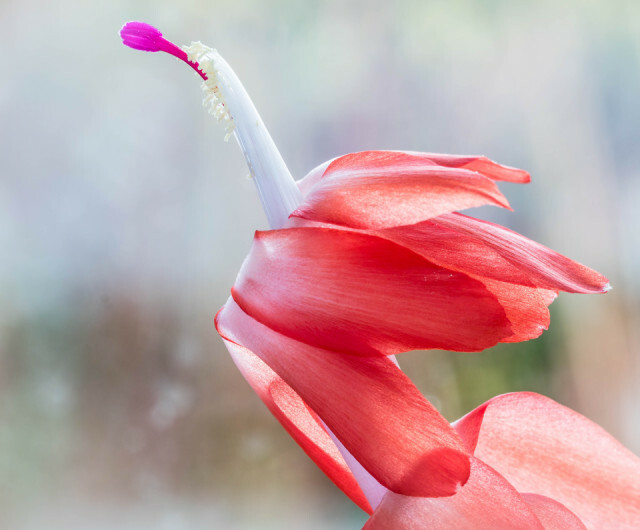 As it normally flowers in November / December it is known as the Christmas Cactus - not to be confused with the Easter Cactus, which flowers in Spring, although both plants originate from South Africa. My specimen is still largely in bud, but my eye was caught by this one flower, which is almost over, but seems to resemble an exotic bird about to take off!